Living in 200 to 300 square foot apartments in New York City for nine years - most with zero kitchen countertop space - you learn what you really need and what you can do without. As a result, I brought very few household goods to our marriage - especially when it came to kitchen stuff. So, the stand mixer collected dust in our first two apartments - an East Village alcove studio and a two-bedroom Gramercy rental. We periodically put it in the closet to make room on the counter for other things. And since this monstrosity weighed approximately, oh, half a ton, hauling it out of the closet was kind of inconvenient. I don't know why I was so resistant to using it - old habits die hard, I guess. This thing that everyone else seemed to embrace just sat there - taunting me - taking up valuable real estate in the kitchen. When packing to move to our current apartment, Scott asked if I wanted to keep the mixer, or just give it away. Since I always seem to be baking something, I figured I might as well try it before packing it up for another move. I decided to make my Almond Cream Cheese Pound Cake, which calls for alternating the addition of flour and eggs while mixing the batter. This process is kind of tedious with a hand mixer, so it seemed like a good "try-out" recipe. Well, wouldn't you know - I loved it! Instead of having to continually start and stop the hand mixer to crack eggs, add flour and scrape down the sides of the bowl, I was able to quickly zip through the mixing, pour the batter into loaf pans and pop them into the oven. Now, I am hooked - at least for some recipes, such as whipping egg whites for soufflés, baking shortbread cookies or making that pound cake. I reach for the hand mixer for small projects - or for simple recipes like these five-ingredient peanut butter cookies - but it is nice to have more than one option. We still store the mixer in a linen closet from time to time, but Scott is happy to retrieve it when needed. After all, when I ask for the mixer, he knows I am in the mood - to bake. 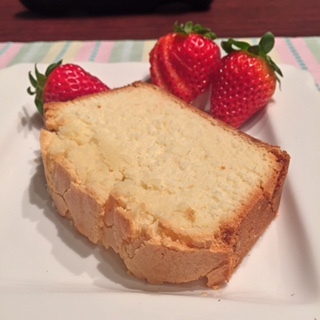 Here is the recipe for that yummy pound cake. Enjoy! Make sure all ingredients are at room temperature. Preheat oven to 325 degrees. Grease one 10-inch tube pan or two loaf pans. Cream together the butter, cream cheese and sugar. Add the vanilla and almond extracts. Add flour and eggs alternately, mixing thoroughly with each addition, starting and ending with the flour. Pour batter into prepared pans. Bake for one hour and 15 minutes, or until knife inserted in the center comes out clean.